Orlandos, in Palaces and Houses of Mistra, 1937. 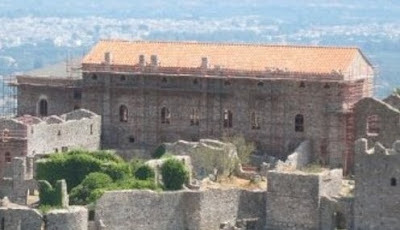 This is a view of the throne-room wing of the palace of Mistra, as seen from the back. 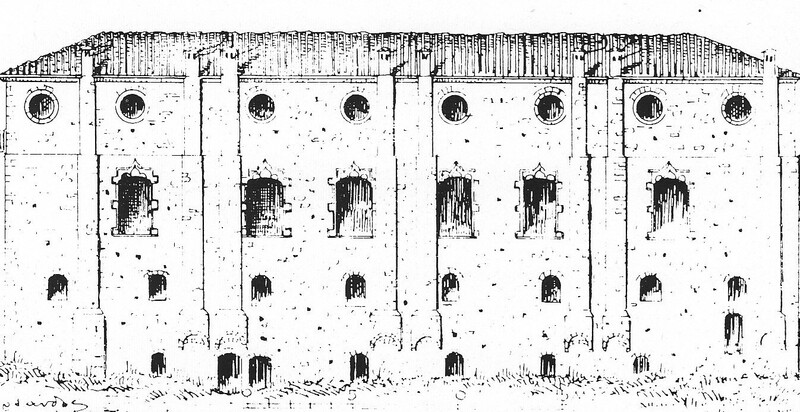 There are eight chimneys, elegantly disposed, fed by eight fireplaces in eight individual rooms on the level under the throne room, which has the largest windows. 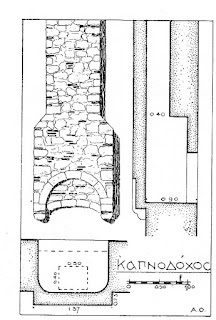 Anastasios Orlandos, in 1937, explained at some length how these chimneys and fireplaces provided heat for the throne room, a space 36.50 meters by 10.43 meters. Architectural historians Charalampos Bouras and Gianluigi Ciotta repeat this information quite flatly, as do the guidebooks and travel books and tourist articles. So I was thinking about that, half-dozing in an afternoon nap, how it would work: how many people would be needed carrying how many armfuls of logs up the stairs to the second floor to keep the fireplaces fed, how much labor and refuse removal would be constantly visible from the formal front of the palace, the constant procession of people carrying armfuls of wood through those twisty difficult Mistra streets. And then I started thinking about our own fireplace, how there is never a sign in the room above when the fireplace is working below, how I do not feel any heat from the chimney even just above the fireplace -- that sort of thing. I compared building materials, thickness of walls and floors, even looked up burning temperatures of different kinds of firewood, and calculations for dimensions of fireplaces. 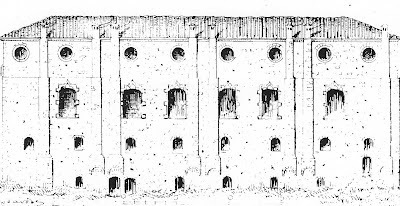 E. Trincanato: Venise: Guide de l'Architecture Mineure (1997). This was the model followed for the rooms on the second level. Heat in the throne room, if any, would have come from portable braziers. And layers and layers of wool. Photograph of chimneys, 1995, after new roof and some reconstruction. Wool and braziers for sure. Chimney building: I read somewhere about a building code in Venice for chimneys to be built only outside the walls, for safety reasons. Carrying of piles of wood: would charcoal have been an option? Wasn't charcoal used in braziers as well? Heating from a floor below: A pension in the old town of Naxos offers as the only winter rent the room above the family's living room, where a fire in a big old fireplace is kept all day. The room above is nicely dry and warm, I spent there once in the beginning of March. Charcoal, absolutely. I should have mentioned it. 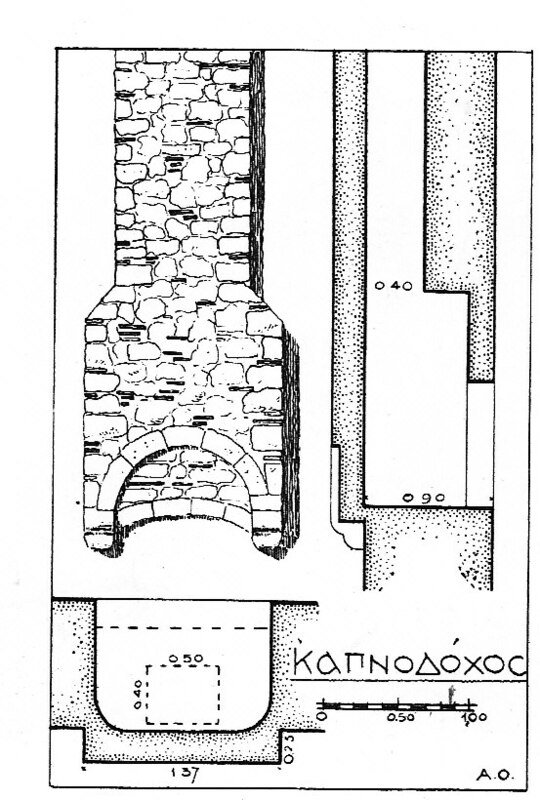 How was the fireplace on Naxos constructed and how thick was the ceiling/floor? I think the Mistra floor is stone about half a meter thick. Walls and ceiling 30 -40 cm thick I think. Fireplace mainly inside the wall, just kind of a roundish swelling to be seen at the outside. And "warm" doesn't mean like a heated house, just dry (not damp) and not cold (compared to outside). Very heavy woollen blankets for the nights which were really cold. I agreee it must have been impossible to get such a big space as the throne hall "warm". This may have no direct bearing, but I grew up in an 18th c. North American farmhouse. While we had a huge fireplace in the main room (and seven others) we found that if we lit the three main fireplaces, in about a week the chimneys warmed the whole house. I grant that they were semi-internal. i just wonder if they threw heat internally. Sounds like an excellent case for some experimental archaeology! Now, if we can get some financing to build a duplicate building . . . Excellent! I'm sure that somewhere there's a corporate sponsor. I'll be happy to use the result as a cottage in Greece... in late 14th c. kit!